Goooooood morning!! I am taking part in Lori Anderson's Bead Hoarders Blog Hop today, and I also have a brandy new tutorial out in my shop, so I thought I would combine the posts. :) Thank you so much, Lori, for hostessing this hop. For those of you who don't know Lori (where have you been?? ), she has been ill this year, and it amazes me that she still does the things she does. It takes a lot of effort and energy to put together hops and to organize all of the blogs, and I know that these mean a great deal to the participants. You rock, Lori - and I hope today is a good day for you. 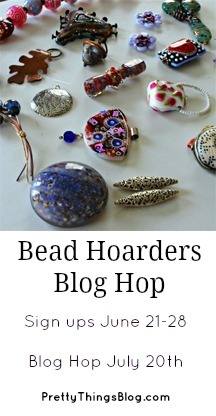 Do I have beads I hoard?? Oh my goodness yes!! I can't get out of Etsy window shopping without grabbing up amazing goodies, even if I'm just pricing things out. Something ALWAYS falls into my cart that I just can't live without... and lots of them stay with me for years, as I never had a plan in mind for them, I just couldn't pass them by. Of course, they aren't ALL art beads, some of them are just incredible Thai silver, or findings that I must have that have a special bead or design inlaid on them. In doing some playing around lately to come up with a design I had in mind, I made myself a wrap bracelet in sterling silver. I wasn't sure if it would be a bracelet, or a necklace... it could have turned into anything; at one point I thought it was an anklet, lol. It does look nice as an asymmetric necklace, but for me, it would have to be longer to make me really happy. It fits perfectly wound around my wrist three times. The two major beads I had hoarded in this were the gorgeous (heavy!) Thai silver round, and one beautiful blue lamp work bead by Clare Scott, and one silver glass spacer bead by Judith Billing. 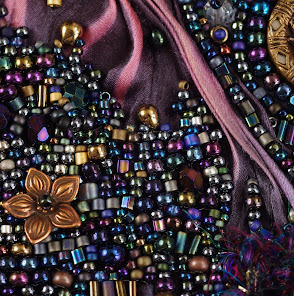 I have a LOT of Clare's beads, and have been working on get more and more of Judith's work as well. They seem to have little galaxies in them, and I find them mesmerizing. I also had the cute little butterfly charm for years now, but since I wasn't sure if it was base metal, I hadn't used it in any jewelry for sale. Since this one is for me, it didn't matter and I threw it on as a last minute touch. The new tutorial is for a necklace I named In Bloom, which features delicate little flowers made from a 8mm chaton base with layers of petals surrounding. I love how my St Petersburg variation looks like feathery greenery as a background! I had a hard time deciding how to finish the piece off, and a few friends of mine suggested this chain as a solution - huge thanks to those friends, as I had a complete blank out until they kick started my brain. I have had a difficult time with my tension on the second half of a double St Pete's chain, and so I came up with this modified version which lays nice and neat and doesn't have the "thread-showing" issue I had with the traditional stitch. The clasp on my peaches and cream version is one of my favorite Elegant Elements clasps, thank you to Beadsmith! !